Alle schepselen op aarde voelen als wij, streven naar geluk als wij. Ze hebben lief, lijden en sterven als wij, en zo zijn zij de aan ons gelijk gestelde werken van de almachtige Schepper: onze broeders. God wenst dat wij de dieren bijstaan wanneer ze hulp gebruiken. Alle wezens in nood hebben gelijke rechten op bescherming. Door de eeuwen heen hebben miljoenen de legende van de heilige Franciscus (1181 - 1226) gehoord en naverteld. Franciscus is vooral bekend om zijn wonderbaarlijke omgang met de dieren. Dierendag - 4 oktober - is verbonden met zijn naam. Hij was een typische middeleeuwse monnik, leerde en praktiseerde soberheid en afkeer van de wereld. Maar, hij wendde hij zich niet af van de schepping. De schepping was, evenals het menselijk lichaam, door God geschapen. "The body-affirming, incarnate side of Christian teaching, combined with a reawakening of the aspiration toward a life of evangelical poverty, came to vivid life in the preaching of ... St. Francis of Assisi, notably in his hymns to the goodness of birds, animals, and all the earth." (Novak 1995). Franciscus richt zijn wantrouwen op de zondige mensenwereld: de kerk van Rome, de Grieken, de wetenschap en een leven gebaseeerd op macht en eigendom. Daarom beoefenden Franciscus en zijn mannen 'afsterving van het vlees', "not because the body was considered evil -it, too, was created by God - but because in a fallen world it could distract one from higher pursuits", aldus David Burr (1996). Zijn ascetisme en zelfverkozen armoede kwamen niet voort uit een soort masochisme, zegt Leonard Boff, maar uit liefde en de wens om dienstbaar te zijn aan de armen. "Franciscus schiep een gemeenschap van broeders die openstond voor de wereld der armen. Hij erkende het als Gods wil, dat hij in de wereld moest blijven en zich niet terugtrekken in een kluizenarij of klooster." The virtue of patience so enfolded them that they sought to be where they could suffer bodily persecution ... Many times when they were insulted, ridiculed, stripped naked, beaten, bound or imprisoned, they trusted in no one's patronage but rather bore all so manfully that only praise and thanksgiving echoed in their mouths ... and [they] shed tears over what they had neglected to do or done carelessly ... Some held themselves up by suspended ropes in order to make sure their worship would not be disturbed by sleep creeping up on them. Others encased their bodies in iron instruments. Still others encased themselves in wooden girdles. If, as usually occurs, their sobriety was disturbed by abundance of food or drink, or if they exceeded the limits of necessity by even a little because they were tired from a journey, they harshly tormented themselves by abstinence for many days. They tried to repress the promptings of the flesh by such great mortification that they did not hesitate to strip naked in the coldest ice or inundate their bodies with a flow of blood by piercing themselves all over with thorns. David Burr vertaalde en becommentarieerde de First and Second Lives of Sint Francis die Thomas van Celano schreef in 1230 en 1247 in opdracht van de kerk. Uit deze internetvertaling is het nu volgende afkomstig (tenzij anders aangegeven). Francis seems to have been a winsome and somewhat feckless young man who threw himself into the social life of his city as enthusiastically as he engaged in its military projects. While taking part in the latter he was captured by the Perugians in 1202 and spent a year in prison. Then, around the age of twenty-three, he underwent a gradual conversion which finally led him to reject his former life and his father's wealth. "Francis," it said, calling him by name, "go and repair my house, which, as you see, is completely destroyed." Francis was stupefied and nearly deranged by this speech ... From then on compassion for the crucified one was imprinted in his holy soul and, one may devoutly suspect, the stigmata of the holy passion were deeply imprinted in his heart, though not yet in his flesh. Hij vertrok daarop naar de stad Foligno en verkocht daar al zijn bezittingen, inclusief zijn kleren en paard. Het verdiende geld ervoer hij als een ballast en Franciscus snelde terug naar St. Damian en schonk het geld aan de priester. The priest was stunned ... He had seen Francis just the other day, so to speak, living riotously among his relations and acquaintances, acting even more stupidly than the rest ... Finally the priest agreed that he could stay but ... he would not accept the money. Francis ... threw it on a window sill, treating it as if it were dust. Pietro, de vader van Franciscus, was een welgesteld koopman. Hij keurde het gedrag van zijn zoon af en hield hem thuis. Maar Franciscus was niet om te praten. Ten einde raad bracht Pietro zijn zoon voor de bisschop van Assisi. Voor het oog van alle aanwezigen trok Franciscus zijn kleren uit en gooide ze naast zich neer. Daar stond hij, naakt voor het oog van alle aanwezigen. Toen begreep de bisschop de goddelijke inspiratie van de jongeling. Vanaf dat moment ging Francis de weg die God voor hem had uitgestippeld. Hij begon te reizen door Umbria, leefde tussen lepralijders en hij renoveerde de kerk van St Damian. At that time he wore a sort of hermit's attire, a leather belt around his waist and a staff in his hands, and he went about wearing shoes. One day, however, when the gospel story of Christ sending his disciples to preach was read in the church ... Francis, rejoicing in the spirit of God ... took off his shoes, tossed away his staff, was satisfied with a single tunic, and exchanged his leather belt for a cord. He made himself a tunic that looked like the cross so that he could beat off the temptations of the devil. Geleidelijk aan vormde zich een kleine groep rond Franciscus. En zo ontstond de Franciscaner orde in 1209. Bij zijn bezoek aan de bisschop van Sabina toonde Franciscus zich opnieuw vastberaden. The bishop began to question Francis about many things and tried to convince him that he should try the life of a monk or hermit. Saint Francis humbly refused his advice as well as he could, not because he despised what the bishop suggested but because, impelled by a higher desire, he devoutly wished for something else. De volgende voorbeelden tonen Franciscus' omgang met de dieren. 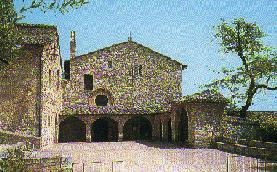 Francis was passing through the valley of Spoleto. He came to a certain place near Bevagna, in which a great many birds of various types had congregated, including doves, crows and some others commonly called daws. When he saw them Francis ... being a man of great fervor and very sympathetic toward the lower, irrational creatures, quickly left his companions on the road and ran over to them. When he got there, he saw that they were waiting expectantly and saluted them. Surprised that the birds had not flown away as they normally do, he was filled with joy and humbly begged them to listen to the word of God. Among the things he told them, he said the following: "My brothers the birds, you should love your creator deeply and praise him always. He has given you feathers to wear, wings to fly with, and what ever else you need. He has made you noble among his creatures and given you a dwelling in the pure air. You neither sow nor reap, yet he nevertheless protects and governs you without any anxiety on your part." ... When he had spoken thus, the birds exulted marvelously in their own fashion, stretching their necks, extending their wings, opening their mouths, and gazing at him. Francis walked into their midst, touching their heads and bodies with his tunic. Finally he blessed them and, making the sign of the cross, gave them permission to fly off to some other place ... [Francis now] began to accuse himself of negligence for not having preached to the birds before ... from that day on, he exhorted all birds, all animals, all reptiles, and even nonexistent creatures to praise and love the creator, for every day, when the name of the savior was announced, he himself saw their obedience. One day he came to a town called Alviano to preach ... he asked for silence. The people became quiet ... but a flock of swallows building nests in that place continued to chatter away, making it impossible for the people to hear. Francis spoke to them, "My sisters the swallows, it's my turn to speak now, because you've already said enough. Listen to the word of God. Stay still and be quiet until it 's over." To the people's amazement, the little birds immediately stopped chattering and did not move until Francis had finished preaching. Those who witnessed this sign were filled with wonder and said, "truly this man is holy and a friend of the Most High." Once ... in the town of Greccio, a hare was caught in a trap and brought live to Francis ... Seeing the hare, the blessed man was moved to pity and said, "Brother hare, come here. Why did you let yourself be fooled in this way?" As soon as the hare was released by the brother. he dashed over to Francis and, without being forced to do so, set tied into his lap as the safest place available. When he had rested there a while, the holy father, stroking him with maternal affection, let him go so that he could return to the wild. Each time he was placed on the ground, the hare ran back to Francis' lap. Finally Francis asked that the brothers carry him to a nearby forest. Something similar occurred with a rabbit, a very undomesticated creature, on an island in the lake of Perugia. Francis was moved by similar pity toward fish ... he threw them back into the water warning them to be careful not to get caught again. Once ... a certain fisherman caught a big fish commonly called a tench and brought it to Francis. He received it joyfully and kindly, took to calling it "brother," and, having placed it in the water next to his boat, began to bless the name of the Lord. For some time, while Francis tended to his prayer, the fish played in the water near the boat, nor did he leave the area until the holy man of God, his prayer completed, gave him permission to go. And as his understanding sought in vain for an explanation and his heart was filled with perplexity at the great novelty of this vision, the marks of nails began to appear in his hands and feet, just as he had seen them slightly earlier in the crucified man above him. His hands and feet seemed to be pierced by nails, with the heads of the nails appearing in the palms of his hands and on the upper sides of his feet, the points appearing on the other side. The marks were round on the palm of each hand but elongated on the other side, and small pieces of flesh jutting out from the rest took on the appearance of the nail-ends, bent and driven back. In the same way the marks of nails were impressed on his feet and projected beyond the rest of the flesh. Moreover, his right side had a large wound as if it had been pierced with a spear, and it often bled so that his tunic and trousers were soaked with his sacred blood. Een soort omgekeerde variant van zijn sterke inlevingsvermogen was zijn uitstraling op anderen. Hij wist mensen te bezielen: "the people were filled with so much love and devotion that they trampled one another hurrying to see and hear him". Tot zover de legende van Franciscus. Zijn naam ontbreekt in geen enkele Berühmte-Vegetarier-Liste of Famous Quotes. Volgens sommigen was Franciscus echter geen (consequente) vegetariër. Het oordeel van Spencer, misschien enigszins gekleurd door hevige anti-Roomse sentimenten, is vernietigend: "the archetypal Christian animal-lover, though he preached to the birds ... still ate them. Though he addressed other animals as Brother and Sister, apperently bestowing equality with the friars themselves upon them, meat was prohibited only on fast days or for purely ascetic reasons." Een feit is dat de Franciscuslegende het verband tussen het eten van vlees en de dierenliefde niet legt. Een feit is ook dat het 'vegetarisme' in de franciscaner kloosterregels niet dwingend werd voorgeschreven. Er waren wel vaker lekenbewegingen ontstaan die vrij het evangelie begonnen te prediken buiten het gezag van de Kerk om. Deze initiatieven werden door de Kerk onderdrukt. Franciscus was minder opstandig. Hij dankte de pauselijke goedkeuring van zijn Orde aan de opname van een regel (nummer 1223) waarin de bereidheid was vastgelegd het evengelie te beleven 'altijd onderdanig en neerliggend aan de voeten van de heilige Kerk'. Misschien was het ook nodig geweest om de volgende regel op te nemen: Volgens het heilig evangelie mogen zij eten van alle spijzen die hun voorgezet worden. "Dit is niet zozeer een afzwakking van de strenge levenswijze van de minderbroeders", aldus Hardick, "als wel een afwijzing van de Kathaarse opvatting over reine en onreine spijzen, een verzet tegen wijdverbreide ketterij en een bescherming van het ware geloof". Indien Franciscus voor zichzelf en zijn medebroeders zeer streng zou zijn geweest en geen vlees zou hebben gegeten, dan zal hij daaraan weinig ruchtbaarheid hebben gegeven. In Franciscus' tijd was een hevige strijd gaande tussen de Kerk en de Katharen. In een aan Antonius van Padua toegeschreven legende, die zou zijn gebaseerd op een voorval uit het leven van Franciscus, eet de held van het verhaal op vrijdag, vastendag, een gebraden haantje, daartoe uitgedaagd door de boosaardige vegetarische katharen. De katharen zelf aten geen vlees of zuivel, wel vis. "Volgens de legende boden zij hem op een vrijdag een gebraden haantje aan en zeiden, dat men volgens het evangelie alles mag eten wat wordt voorgezet (Lucas 10:8). Antonius begon werkelijk te eten. Ondertussen ontboden zijn tegenstanders de bisschop. Toen deze aankwam, had Antonius zijn maatijd beëindigd. Alleen de botjes waren nog over. Maar hij wist zich te redden. Hij maakt een kruis over de kippebotjes en zij veranderden in een visgraat. Vis eten was op vrijdag geoorloofd en ook voor de Katharen was vis 'rein'" (Hardick). Het verhaal moest natuurlijk bewijzen dat God aan de zijde stond van Antonius. Consequent geen vlees eten werd voortaan een bewijs van ketterdom, het eten van vlees op vrijdag daarentegen was slechts een vergefelijke zonde. Franciscus zelf zou ten aanzien van de ketters nogal discreet zijn geweest: "Ketters waren er in Assisi en Spoleto; ze slaagden er zelfs in binnen te dringen in de franciscaanse beweging. In de geschriften van Franciscus merkt men alleen indirect, dat hij zijn Orde tegen hen afschermt, nooit valt hij hen direct aan, want hij wil geen mogelijke bruggen afbreken, noch tegen hen optreden met wapens, zoals dat toen de gewoonte was", aldus Boff die Franciscus een vredestichter en bevrijder noemt en aan het citaat toevoegt: "Dezelfde houding van vrede te scheppen en te herstellen neemt hij ook aan met betrekking tot de dieren. Franciscus liet de gevangen vogels vrij, het schaapje dat naar de slagerij gebracht wordt, koopt hij en hij is verontwaardigd over allen die dieren mishandelen." Volgens Barkas was Franciscus een vegetariër. Althans, voor het grootste deel van de tijd, daar "hij als leidraad in de regels voor zijn orde de woorden van Christus in de evengeliën voor ogen hield; en in Lucas staat geschreven: 'Eet wat u voorgezet wordt'. Daarom werd het vegetarisme in zijn regels voor de franciscanen niet opgenomen; maar zijn biografen, Thomas van Celano en Sint-Bonaventura, noemen voorbeelden waarin Sint-Franciscus vlees at als uitzonderingen op zijn normaliter vleesloze maaltijden." Dit zal ook gegolden hebben voor zijn volgelingen. Enkelen van hen, Clara, Agnes, Antonius en Bonaventura, komen hieronder kort ter sprake. Clara werd in Assisi geboren uit een adellijke familie. Vlak voor de bevalling waren vader Favarone di Offreduccio di Bernardino en zijn vrouw Ortolana naar de kathedraal van St. Rufinus gegaan om te bidden. Ortolana hoorde toen een stem spreken "O vrouw, vrees niet, want gij zult een gelukig kind baren dat een helder licht over de wereld zal laten schijnen". In de kathedraal werd Clara gedoopt en voor een belangrijk deel ontving zij hier haar opvoeding. Haar moeder Ortolana, die naar het Heilige Land was gereisd met de kruisvaarders, besteedde veel zorg aan de opvoeding van haar dochters. Maar op de nacht na Palmzondag in het jaar 1212 vluchtte Clara het huis uit en samen met Pacifica di Guelfuccio (die als eerste zuster de Franciscaner Orde zou betreden) vertrok zij naar Porziuncola, waar Franciscus en zijn broeders de jonge vrouwen opwachtten. Franciscus knipte het haar van Clara af en gaf haar een monnikenpij. Haar vader trachtte vergeefs Clara over te halen weer naar huis te komen, maar zij weigerde. Franciscus vond voor haar asiel in de kerk van St. Damian. Haar zuster Agnes volgde niet veel later evenals andere jonge vrouwen. Zo werd de kerk het moederhuis voor de zusters en kreeg de bijnaam kerk van de Arme Vrouwen of Arme Clara's. De zusters deden afstand van hun bezittingen. Clara betreurde het zeer toen zij hoorde dat sommige kloosters waren begonnen inkomens te derven en bezittingen te verzamelen. In 1243 werd het klooster van St. Damian aangevallen door de Saracenen maar Clara dreef de horde manmoedig het klooster uit (Mattia). De arme vrouwen waren vegetariërs: "Clare and her sisters wore no shoes, ate no meat, lived in a poor house, and kept silent most of the time" (Catholic Saints Online). Antonius van Padua (1195-1231) trad toe tot de Orde der Franciscanen. Ook hij was een asceet en verrichtte vele wonderen, vooral naar het schijnt, om zijn ketterse tegenstanders een lesje te leren. Deze laatsten daagden hem uit gif te nemen. Hij deed het. En op een vrijdag - vastendag - redde God de onkreukbare door resten verdachte kippebotjes in onverdachte visgraten te veranderen. Bekend is Antonius' preek voor de vissen. In de kustplaats Rimini had Antonius dagenlang vergeefs geprobeerd de katharen van hun dwalingen te bekeren. Ten einde raad trok hij zich terug op een zandbank in zee. Daar sprak hij tot de vissen (vrij samengevat): "Luister naar het woord van God, o jullie vissen van de zee en de rivier, want de ongelovige ketters weigeren te luisteren naar Gods woord". Terwijl hij sprak kwamen grote scholen vissen naar de bank. Daar stonden de vissekoppen strak in het gelid, schijnbaar om geen woord te hoeven missen van wat Antonius te vertellen had. "Broeders", sprak Antonius, "God heeft jullie het water gegeven en Hij heeft jullie gezegend. Tijdens de zondvloed werden jullie gespaard en jullie zijn vrij in het water van de rivier en de zee. Door een mysterie werden jullie het voedsel van de eeuwige koning, Jezus Christus. Prijst Hem voor de zegeningen die Hij jullie schonk." De vissen bogen daarop dankbaar het hoofd en Antonius, dit ziende, sprak vervuld van Geest: "Gezegend God, want de vissen der zee eren Hem meer dan de ongelovigen; de redeloze dieren luisteren naar Hem met groter aandacht dan de zondige ketters van de stad". Toen de mensen over dit wonder hoorden vertellen, kwamen zij uit de stad naar de bank. Onder hen bevonden zich ook de ongelovige ketters. Allen werden geraakt in hun harten en knielden voor Antonius. Antonius was een volgeling van Franciscus. Dat hij tot de vissen predikte was geen dwaze gedachte. "Volgens Franciscus was het zinvol, ja zelfs noodzakelijk aan alle door het Woord geschapen wezens de boodschap van dit eeuwige Woord te verkondigen ... Historisch of niet, in de middeleeuwen wist men zulke wonderverhalen te waarderen. Ze verspreidden zich snel en bereikten het gewenste doel: de roem van de een heilige te verhogen. Misschien heeft men daarbij ook wel gedacht aan de Katharen. Een vis was in hun ogen 'rein', uitgesloten van het kwaad. Deze dieren hadden naar Antonius geluisterd, terwij de 'reine' Katharen het hardnekkig weigerden" (Hardick). De preek voor de vissen heeft met dierenliefde niets te maken te hebben. Voor Antonius waren de vissen een geschikte derde partij om succesvol reklame te maken voor het katholieke geloof. Spencer: "St Anthony probably went back home and grilled a few of them for supper. Or if not, the fact that fish was an integral part of their diet, a necessity on fast days, was never questioned by either St Francis of St Anthony, nor by the people who were told this story ... The medieval mind saw the animal kingdom in a deeply complex and contradictory way."